The Hexagon is an installation designed through the conception of multiple polygons – molded, altered and distorted to fabricate the skin of the façade. This special-order installation for a private residence in New Delhi reinterprets the hexagon to create dynamic three-dimensional surfaces. 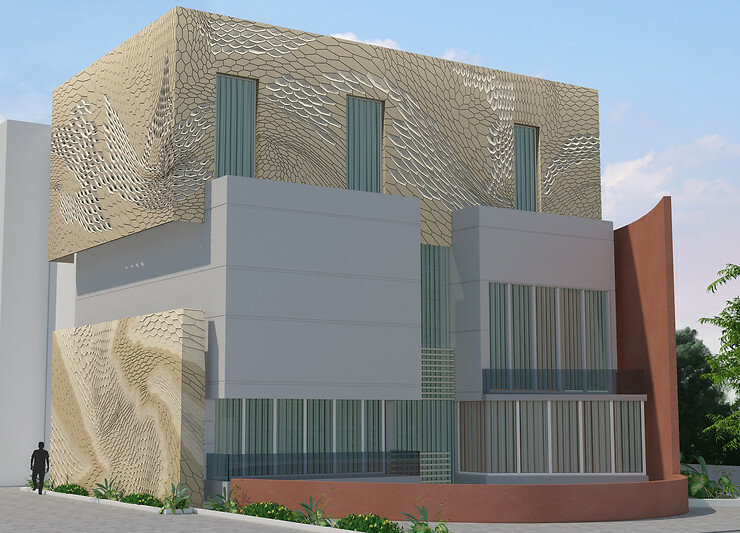 A collaboration with the architect, we got involved right at the design conceptualization stage, creating intricate patterns through digital innovation and producing technical drawings to aid installation on site. The surface of the facade has been treated with variations of these hexagon pieces crafted in stone. Individual constituent hexagons, distorted by pushing, pulling, and stretching, allow creation of varied permutations,generating unique modules.Cut along the lines of patterns, the various modules seamlessly fit into each other through interlocking joints. The distorted hexagons are arranged on the elevation to create a dynamic pattern. 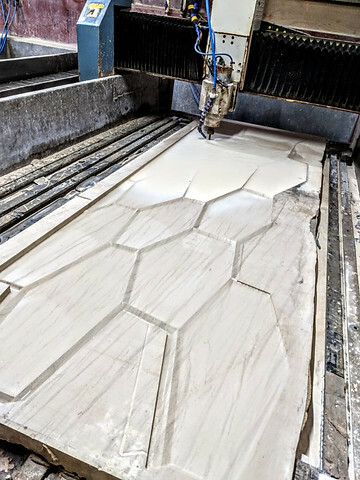 A combination of 30mm, 50mm, and 75mm-thick stone slabs is used for various sections of the surface,with each area treated to suit specific concerns of transparency, aesthetics, and budget. The feature wall is finished in modules carved in 50-mm-thick stone and the upper portion of the elevation is done in 30-mm-thick stone. This is done to optimize project cost to suit the design brief. The Hexagon manifests itself as a jaali (perforated surface) wrapping around the courtyard, located at the backside of the residence. The double-sided jaali consists of two perforated screens with the framework inserted between them. This backlit installation aesthetically uplifts the appearance of this residence, visually distinguishing it from adjacent structures.